I love Athleta. Their designs are lively, colorful, and functional, their fabrics are great, and they have some of the best customer service I’ve ever experienced. I’ve been shopping with them for a long time (and before they were bought by the GAP corporation – Athleta actually originated in Petaluma), and I’ve loved the clothing I’ve purchased from them. One of the really interesting policies they have is their “Give-It-A-Workout” Guarantee. They say they will take back merchandise at any time, for any reason, even if it’s been worn! Actually, the guarantee’s wording more makes it sound like they *expect* returns have been worn (well, unless you just know off the bat it’s not going to work out). Another company that does this is REI, and I think both of these businesses are fantastic for it … but I’ve really never felt right about returning anything to either of these places if I’ve taken the tags off. I don’t know why, but I always felt like it was almost abusing the policy to return something I used that I just didn’t like – I thought maybe if it fell apart or was seriously flawed, that was one thing – but if it just wasn’t working out great, I should just deal with it. That point of view of course has on several occasions not turned out in my favor. My first pair of paddling gloves were a bit snug when I bought them and never loosened up (I ended up buying a different pair). There are several pairs of pants in my closet I’m waiting to have fit me better (but that’s my fault, right? Ha ha ha). One of my workout tops popped an underwire in the wash after a while … but I never had any intention of returning any of these items. 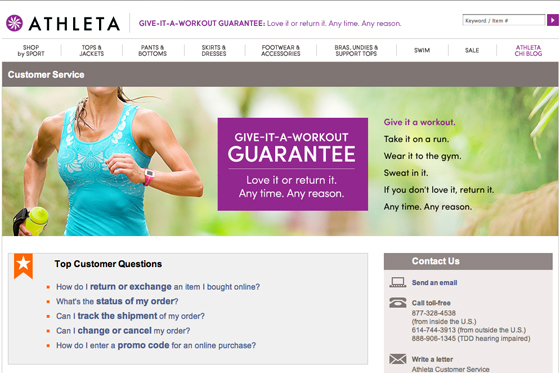 Well for some reason, when a dress I ordered came today, I was so torn between how excited I was about it and how it ended up looking when it got here, that I took a good, hard, look at Athleta’s guarantee again, and realized all that I just wrote above – that part of their customer service is that they want you to seriously be 100% happy with your purchase. 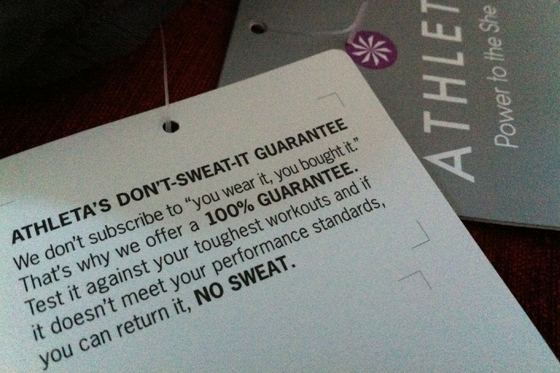 They even print more wording of their guarantee on their tags. And so today, for the first time in about a decade, I’m deciding to use this really great guarantee. I am going on a short but crazy busy vacation, and I’m taking this dress; down to scorching Anaheim, over to the blazing and rainy Caribbean, and to muggy, wet Florida, and I’m going to test it out. I will definitely sweat in it, I’ll wash it a few times, and it will get rained on and used a lot. But I’m cutting the tag off this dress, I’ll try not to sweat it, and I’ll “give it a workout.” Wish me luck!